Is your Insurance treating you fairly? We have been working hard on some pretty killer sites. Check this one out! MCA is a full featured site which allows anyone to become a subscriber for a mere $2.99 a month (Auto) or $4.99 a month (Premium). 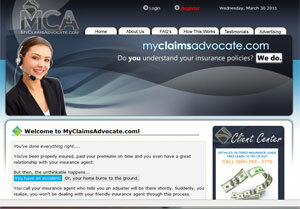 What MCA will do is take your side when the inevitable happens and it is time to file an insurance claim. Believe it or not, Insurance Companies do not always have your best interests in mind when it comes time to pay a claim – they are looking out for their bottom line as well. The minds behind MCA are licensed insurance professionals that know what to look out for and will make sure you are treated fairly in your claim. The site features an interactive communication system between insurance professionals and clients, a full featured login system which allows subscribers access to tons of content and dirt on the insurance industry, and the ability to update or cancel your subscription at any time.